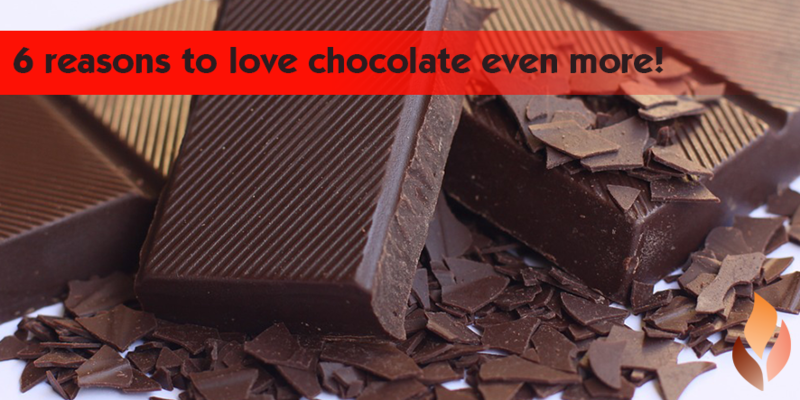 Home » Events and Blogs » Blog » 6 reasons to love chocolate even more! 6 reasons to love chocolate even more! When we say chocolate, we mean dark, natural chocolate – the best kind of chocolate! What you may not realise is that not only does this form of chocolate taste delicious, but it also comes with a wide array of health benefits! The health benefits in chocolate come from the antioxidants found in both cacao and cocoa (and yes, they’re not the same thing). Cacao refers to the seeds cultivated from a small evergreen tree. Chocolate is made from a preparation of cacao seeds where they are typically roasted. However, if the cacao seeds are not roasted we then have ‘raw chocolate’. On the other hand, cocoa is the powder made from roasted, husked and ground cacao seeds. Put simply, cocoa powder is raw cacao that has been roasted at high temperatures. Wouldn’t it be a great feeling if when we indulged in chocolate, we didn’t feel engulfed with negative emotions? By consuming 1-2 pieces of high-quality, dark, natural chocolate each day you don’t have to worry! Because with it, comes benefits your body will love (not just your tastebuds!). 1. Fallen in love with chocolate? The heart never lies! And what’s better still is that your heart LOVES chocolate, literally! Recent studies have shown that small amounts of dark chocolate can reduce your risk of heart attack as it reduces the clumping of platelets, which cause blood to clot. It’s also cardioprotective – lowering blood pressure, improving lipid profile and helping prevent atrial fibrillation! Yep, you read right! Studies have shown that your gut bacteria can break down and ferment the components of dark chocolate thereby turning them into anti-inflammatory compounds that are great for your health! Particularly in reducing inflammation of cardiovascular tissue! Chocolate contains both caffeine and theobromine, which have been shown to produce higher levels of physical energy and mental alertness! Chocolate has also been linked to lower risks of Alzheimer’s and even living a longer life! 4. Benefits, benefits and more benefits! 5. You can make it yourself! Making your own chocolate or chocolaty sweet treat is super fun, highly rewarding and absolutely yummy! It also means you can see exactly what goes in it, so you can have peace of mind that no naughty ingredients have slid in! For a chocolaty sweet treat, check out our Sweet Potato Brownies! Indulging in high-quality, natural, dark chocolate brings you enough benefits that you can erase any guilt you may usually feel after eating something bad for you. The key is to restrain yourself from over-indulging and to ensure the chocolate you’re putting into your body is the BEST sort for you! Avoid heavily processed, lighter chocolates loaded with preservatives and chemicals.